The related issues of militarism, the ethics of war, consequences of war actions on civilian and military populations, and how distant spectators engage with these problems, are weighty topics. They have become more exceedingly pressing in recent times, when war journalists can enable viewers from around the world to observe war events in real time, providing high-quality videos and photographs to reveal military attacks, soldiers’ actions on both sides, and life of civilians and GIs in the nightmare of war. Such war films, photographs, and other evidences that unveil war tragedy, constitute the visual culture of war. In Distant Wars Visible: The Ambivalence of Witnessing, Wendy Kozol gives special attention to photographic images of personal and/or collective trauma, tackling the issue of witnessing. The author’s contention is that witnessing is equivocal as it may trigger two chief reactions: on the one hand, the war events depicted in the artifacts of visual culture turn into a spectacle making viewers contemplate them; on the other hand, the images of tragedy considered evidences of violence and brutality may evoke sympathy and empathy. In the course of an introduction, five chapters, and a conclusion, the author scrupulously investigates complex relations between photos from war zones as pure phenomena of public display and empathy that (can) provoke in distant observers. Kozol’s study encompasses some key wars of the 20th and 21st centuries. The first two chapters offer a critical historical and cultural examination of wars the USA has recently participated in, namely the Balkan War and the Afghanistan War. In her analysis of the war in former Yugoslavia, Kozol looks over the coverage of news made by Time, Newsweek, and U.S. News & World Report that reveal the photo evidence of the NATO interference in the war-torn regions and offers her readers an extensive visual analysis of selected images. Alongside with a careful scrutiny of a number of photo examples (e.g. a fleeing Albanian Kosovar mother with a baby; fleeing Albanian Kosovar refugees at a train station; Albanian Kosovar refugees’ attempt to cross the border into Macedonia), Kozol also considers Melanie Friend’s project Home and Gardens that tells a story of Albanian Kosovars oppressed by the Serbian government in the 1990s. In the next chapter, the author turns to the images of the War in Afghanistan spread by such a significant wire service as AP. She provides a meticulous analysis of photographs by Rodrigo Abd, Kamran Jebreili, Bullit Marquez, John McConnico, Faraidoon Poya, Amir Shah, as well as a series taken by Silvia Izquierdo. Kozol states that photographs provided by significant US news resources “all routinely depict conditions for women caught up in military conflict” (73), which gives her ground to investigate the pictures from the perspectives of gender and race. The author claims that the issue of “women’s/human/rights” that these pictures communicate first reinforces values of the western countries, particularly, the USA as “freedom and democracy” and, second, makes obvious “gendered vulnerabilities” encumbered with the state of being part of “a community at war” (94). Additionally, Kozol discusses the role of the USA in her examinations of the Balkan War and the Afghanistan War, explaining the US participation in relation to its imperialistic desires. She also underlines the role of the USA as a global leader, which, to some extent, justifies American interventions. The argument is further developed in the third chapter where Kozol deals with the videos and photos that appear on the US missile defense websites that, in turn, foresee “U.S. territorial expansion in Space as an extension of national borders” (98). Besides a detailed analysis of various missile defense websites (Missilethreat.com, High Frontier, Global Security, and MDAA) that she compares to Trevor Paglen’s project The Other Night Sky, the author also examines the documentary 33 Minutes: Protecting America in the New Missile Age. The uniqueness of Kozol’s approach, i.e., to contrast radically different wars and compare the evidence of barbarism from the Second Gulf War and the Second World War, is to the greatest degree illustrated in the fourth chapter. Here she continues elaborating on the issue of “ethical witnessing” (127) unexpectedly contrasting a photo archive from Abu Ghraib with the one from World War II (Wendy Kozol’s family archive), asking whether or not the first one “hails the viewer as a complicit partner in the torture” (127). Indicating a sharp difference between “battlefield souvenirs” that some American soldiers took from battlefields in the Pacific and torture photographs of Iraqi prisoners, the author pinpoints that both “share an archival impulse that initiates the durational event of wartime violence” (131). The end of the chapter provides an elaborate analysis of Adam Broomberg and Oliver Chanarin’s project Red House – the photographs of Kurdish prisoner’s drawings on cell walls in one of Saddam Hussein’s torture prisons. The final chapter offers a brief but insightful examination of photos taken by Rebecca Baron, Binh Danh, Jon Haddock, Vik Muniz, and Joe Sacco that illustrate a conflict in Gaza in the 1950s, the Vietnam War, and the genocide in Cambodia in the 1970s. She does so to “reexamine the presence of documentary evidence in historical memories of military atrocities” (166) and to answer the question “what these works can tell us about obligations of remembrance” (167). 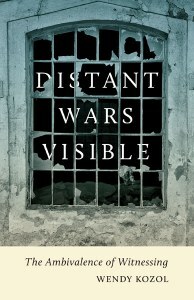 Overall, Wendy Kozol’s Distant Wars Visible: Ambivalence of Witnessing is a compelling study that undertakes the task of showcasing “how visual cultures enable or constrain strategies of witnessing” (205). Posing questions relevant to the raised issue in every chapter and then profoundly investigating visual studies material to give solid answers, Kozol empowers her readers to understand the visual culture of war and see how the problem of ethics is woven into it. This extraordinary book is a recommendable reading to those concerned with visual analysis, war photography, and US military history of the 20th and especially 21st centuries. I am a doctoral candidate in American Studies at Philipps-University of Marburg, Germany. I am working on my Ph.D. project that analyzes the representation of U.S. interventionism from 1990 onward and American culture of imperialism in film and fiction; I combine U.S. Foreign Policy with Literary and Media Studies. My three publications – in Peace Review: A Journal of Social Justice, Popular Culture Review, and The Journal Of Popular Culture – are forthcoming in 2015. I received my M.A. in English and American Studies from Otto-Friedrich-University of Bamberg, Germany, and a Teaching Degree in English and German from Ryazan State University, Russia.